Florida’s waterways hide wondrous, ancient creatures. Crocodilians — alligators, crocodiles, caimans and gharials — inhabit tropical and warm-temperate lowlands in Africa, Asia, Australia and the Americas. Human impacts threaten many crocodilians, but conservation and science-driven management can help these old-timers survive and continue their valuable “jobs,” as top predators in their ecosystem. Here's how to recognize all four. Adults black/dark dark grey, brown tones on the back, yellow-white bellies. Broader, round snout; lower teeth not visible in closed mouth. Narrower, pointed snout; fourth lower tooth visible in closed mouth; irregular pattern of bony plates between shoulders and head. Invasive breeding populations in areas of Broward and Dade counties. Resembles American alligator, but slightly pointier, more triangular head; ridge in front of eyes. Nonnative; a few reported in south Florida; no established population, but more research is suggested. Looks like American crocodile, but slightly broader snout and regular pattern of bony plates on back. Crocodilians thrive in wetland environments using many adaptations, or survival tools. 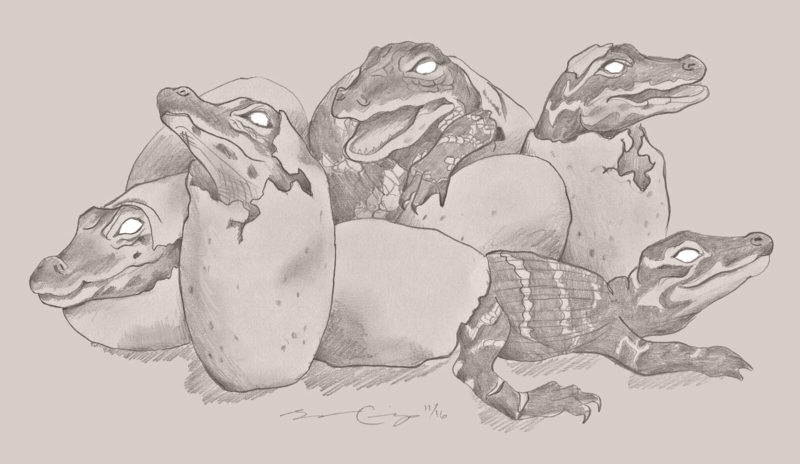 Their tough skin and osteoderms — bone-plated scales on their back and sides — protect against injury and attack and absorb heat. Their greenish, brownish or black skin provides camouflage. Crocodilians are naturally tough, but they needed new armor – including conservation laws and careful management – to survive the age of humans. 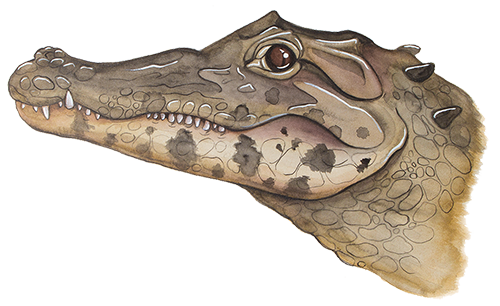 Crocodilians have been threatened by historical overhunting, habitat loss, and pollution. Mote scientist Melissa Bernhard studied chemicals called endocrine disruptors and their possible effects on biological signaling in alligators’ bodies. She cautions that the more contaminants in the environment, the greater risk of harm to crocodilians, such as changes in sexual development and reproduction. Experience The Teeth Beneath and learn more about these amazing animals. Professional reviewers: Melissa Bernhard from Mote (did past work on alligators) and her colleagues from other institutions, including Allan Woodward from FWC. American Crocodile: species profile. (2016, November 8). Retrieved from: https://www.nps.gov/ever/learn/nature/crocodile.htm Info on: species range, differentiating from other crocodilians, appearance, feeding, behavior, survival issues, and more. Alligator Facts. (2016, November 8). Retrieved from: http://myfwc.com/wildlifehabitats/managed/alligator/facts/ Brief info on multiple alligator topics with Florida focus, such as diet, size, range, conservation status, reproduction and thermoregulation. Includes interesting section/link with adaptations info. Differences Between Crocodiles and Alligators. (2016, November 8). Retrieved from: http://myfwc.com/wildlifehabitats/managed/american-crocodile/croc-or-gator/ Succinct table with key differences, including illustrative photos. Since this is a government agency website, FWC, we could presumably ask for pictures posted there or here for possible use in our exhibit. Squires, M. A. Farris, S. C., Jeffrey, B. M., and Mazzotti, F. J. (2013). Native and Nonnative Crocodilians of Florida. WEC335, one of a series of the Wildlife Ecology and Conservation Department, UF/IFAS Extension. Retrieved from: http://edis.ifas.ufl.edu/uw380 Differences among four species in Florida, the native American alligator and American Crocodile, along with the nonnative spectacled caiman and Nile crocodile. American Alligator: Alligator mississippiensis. (2008). Retrieved from: https://www.fws.gov/endangered/esa-library/pdf/alligator.pdf Details about alligator population decline and recovery; description and diet; breeding and life history; biological role. Classification of Living Crocodilians. (2016, November 8). Retrieved from: http://www.iucncsg.org/pages/Classification-of-Living-Crocodilians.html Lists 24 species in three families within class Crocodilia. Ross, J. P., and Wermuth, H. F. (2016, November 8). Crocodile. Encyclopaedia Britannica. Retrieved from: https://www.britannica.com/animal/crocodile Mentions 23 Crocodilian species (different from above). General characteristics of crocodilians; distribution (broadly, not just Florida); natural history; behavior; clip of alligator vocalization (bellowing); anatomy & physiology; breeding; adaptations; evolution and classification. I haven’t read it all, but I assume most of it is broad and focused on Crocodilians as a class, rather than any single species in depth. Not sure. Nonnatives - Spectacled Caiman. (2016, November 9). Retrieved from: http://myfwc.com/wildlifehabitats/nonnatives/reptiles/spectacled-caiman/ Very basic info on where it’s from, how it has invaded Florida, what it looks like and why it’s a concern. Common Caiman. (2016, November 9). Retrieved from: https://nas.er.usgs.gov/queries/factsheet.aspx?SpeciesID=222 More detailed and more recent information about where common caimans (same sci name as spectacled caimans) have invaded, as late as 2007-2009 in Florida. Invaded areas and impacts beyond Florida. Impacts of invasions. Spectacled Caiman. (2016, November 9). Retrieved from: http://www.arkive.org/spectacled-caiman/caiman-crocodilus/ Biology/behavior, life history, feeding, appearance/size, habitat, conservation status, hunting and pet trade. Information on the adaptations on crocodilians. Information specifically pertaining to crocodilians nictitating membrane. Crocodiles facts and pictures. Facts about biology. Information about alligators tendency to undergo torpor during the winter months. Information regarding the bite force strength between crocodiles and alligators. Rice, A. N. (2004). Diet and condition of American alligators (Alligator mississippiensis) in three central Florida lakes: A thesis presented to the graduate school of the University of Florida. Retrieved from: http://myfwc.com/media/310266/Alligator-Rice-A.pdf Discusses how American alligators are opportunistic predators, whose diet may vary depending on the location and the condition of the habitat. Specifically focuses on gators in Lake Apopka, Lake Griffin and Lake Woodruff in central Florida. Discusses prey types and body condition, but acknowledges that prey may not be the only factor in body condition and/or population success. Alligators and Crocodiles. (2016, November 10). Retrieved from: http://edis.ifas.ufl.edu/topic_alligators Links on the University of Florida website to multiple resources that might help. Includes links about human-alligator relationship and conflict, along with alligators as indicator species for Everglades restoration. Swiman, E., Hostetler, M., Main, M., Miller, S. W. (2005). Living with Alligators: A Florida Reality. WEC203, one of a series of the Wildlife Ecology and Conservation, UF/IFAS Extension. Retrieved from: http://edis.ifas.ufl.edu/uw230 Includes “How can I stay safe around alligators?” Gives FWC number to report nuisance gators. Also, common misconceptions about alligators. Ober, H.K., Dutton, H.J., Woodward, A.R., Hord, L.J. and Giuliano, W.M. Giuliano. (2014). Managing Conflicts with Wildlife: Living with Alligators. WEC348, one of a series of the Wildlife Ecology and Conservation Department, UF/IFAS Extension. Retrieved from: http://edis.ifas.ufl.edu/uw393 Lists specific concerns/risks around alligator interactions and how to decrease risk. 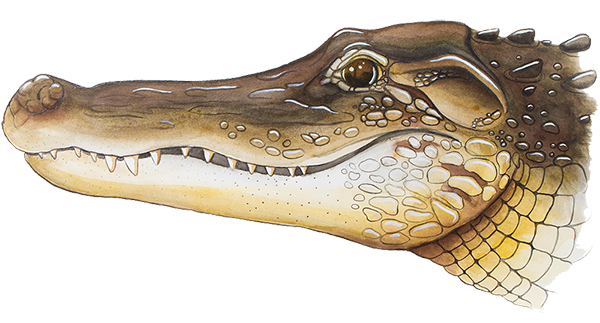 Livingston S. (2016) Man-eating monster crocodile may be Florida’s newest invasive species. University of Florida News. 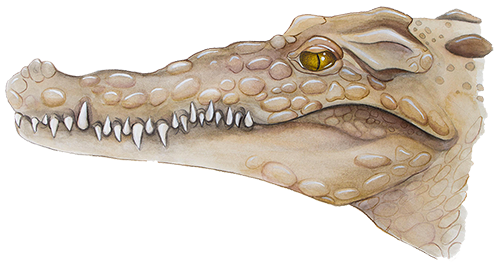 Retrieved from: http://news.ufl.edu/articles/2016/05/man-eating-monster-crocodile-may-be-floridas-newest-invasive-species.php UF news story based upon a journal article describes UF’s finding of a few nonnative Nile crocodiles in south Florida in recent years. Florida Fish and Wildlife Conservation Commission Alligator Bites on People in Florida (September 2016). Retrieved from: http://myfwc.com/media/310203/Alligator-GatorBites.pdf Lists numbers and information about unprovoked gator bites in Florida up to September 2016. Provides number for the Statewide Nuisance Alligator Program: 1-866-FWC-GATOR (392-4286). A lot of good information about the biological processes that occur within vertebrates including crocodilians. Suckling, K., Greenwald, N., Curry, T. (2012) On Time, On Target: How the Endangered Species Act is Saving America’s wildlife. Retrieved from: http://www.esasuccess.org/pdfs/110_REPORT.pdf Table 2 says that American crocodiles had a population increase of 1,290% between 1975 and 2007. This report does not mention American Alligators. American Alligator. (2016 November 11). Retrieved from: http://www.fishwildlife.org/files/Alligatorwebsite.pdf Focuses on the decline and successful recovery of its populations, specifically in the context of trade in crocodilian products and CITES. The Endangered Species Act: A Wild Success. (2016 November 18). Retrieved from: http://www.biologicaldiversity.org/campaigns/esa_wild_success/ Has a paragraph on decline and recovery of American crocodile. Caiman crocodilus (Common caiman). (2016 November 18). Retrieved from: http://www.iucnredlist.org/details/46584/0 Lists the species as lower risk/least concern and widespread (notes U.S. introduction), but says it is locally extirpated in some places. Looks like status has improved, since it had an IUCN listing of threatened in the late 1980s. The current listing is from 1996 and needs updating. Discusses fossil record of Alligator species in Florida. Includes mention of fossils 2 million years old.